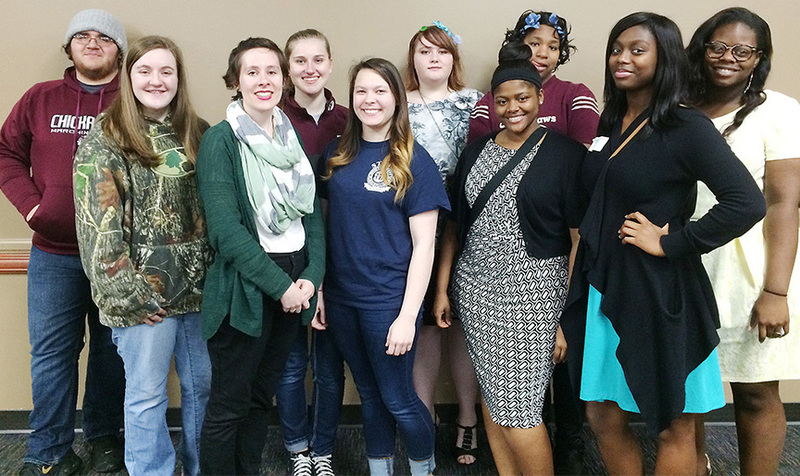 Blytheville High School students who participated in the April 1 state science fair at the University of Central Arkansas include (front, from left) Madison Groves, BHS chemistry instructor and science fair coordinator Virginia Andrews, Kendle Berry, Lasi McGhee, Jamie Hooks, (in back, from left) Caleb Gleason, Megan Jenkins, Amber Deason, A’kyia Cannon and Alycia Osagie. Twenty-two students from Blytheville High School competed at the Northeast Arkansas Regional Science Fair in Jonesboro on March 17. Of that number, 11 continued their quest at the Arkansas State Science Fair at the University of Central Arkansas on April 1, with junior Madison Groves receiving honorable mention in Behavioral and Social Sciences. “The students completed their science fair projects throughout the year in class, and some students have been working on continuation projects for the last two to three years,” said Virginia Andrews, BHS chemistry instructor and coordinator of the BHS science fair. “Five seniors, three juniors and three freshmen won at the the regional fair. The winners from BHS included senior Jamie Hooks and junior Caleb Gleason, first place in the team category; senior Kendle Berry and junior Megan Jenkins, second place in team; Groves, second in Behavioral and Social Sciences; freshman Julia Bullard, third in Animal Sciences; freshman A'kiya Cannon, third in Environmental Sciences; seniors Lasi McGhee and Alycia Osagie, Honorable Mention in team; freshman Nicholas Whitaker, Honorable Mention in Environmental Sciences, and senior Amber Deason, Honorable Mention in Physics and Astronomy.